A key part of ART 180's mission is to give young people a voice in the community. We accomplish this partly through products that present their creative work and that inspire other people to express their creativity. Sale proceeds benefit future ART 180 programs. If you are in the Richmond area and want to save some money on shipping, we encourage you to stop by the ART 180 office (114 W Marshall St Richmond, VA 23220) in Jackson Ward and purchase the products in person. We are always pleased to see you! Plus, you get a behind-the-scenes look at the magic that is ART 180. Produced by Chuck Scalin with assistance from Matt Lively, the Artists Coloring Book features work from 30 artists - 11 from the original 1969 edition with the addition of 19 noted Richmond artists. 11x14, perfect bound. Set of signed prints in custom engraved box set also for sale. $10 includes tax & shipping. Three girl scouts—Lucy Diggs, Matty Pahren, and Morgan Baxter—raised $10,000 to make 500 of these "Bags O' Art." With support from Virginia Commonwealth University design student, Jessica Stevens, each bag is printed with the custom "Bag O' Art" logo and filled with an abundance of art supplies and their original creative companion guide, the "Book O' Art". You can now have a little bit of ART 180 wherever you go. It's great as a gift for the special young person in your life! Bag includes Book O' Art, colored pencils, kneaded rubber eraser, lead pencils, modeling clay, pencil sharpener, and sketchbook. This little book of creative prompts came about when three Girl Scouts in Richmond, Virginia, brainstormed ideas for their Silver Star project. The 13-year-olds created this companion activity book to exercise and build your creative muscles. It is included in the Bag O' Art above and sold separately here. Four Richmond artists worked with children at Crestview Elementary School, dubbed the "little U.N. of Henrico County Schools" for its ethnic diversity. 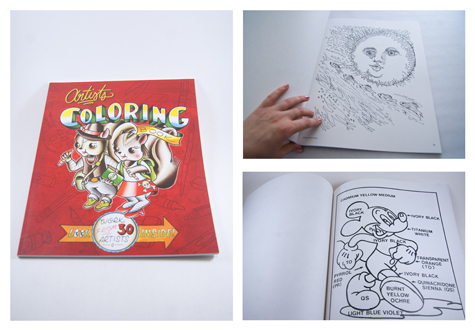 This book features the creative work of 19 children participating in the project. 52 pages, 8" x 12" perfect bound. Life is fun but not if you carry a gun is a series of illustrated poems written by young residents of Gilpin Court, a public housing community in Richmond located near the historic Jackson Ward community. For many of them, their words represent their first exposure to poetry. For many of us, they represent our first exposure to their world. A world made up of pizza and God, fear and basketball, popcorn and dreams. These 10 blank notecards—featuring quotes from young people in ART 180 programs—promote the simple joy of sending and receiving snail mail. Use them to celebrate a special occasion, make a new pen-pal, thank a friend, or just say hello. Two versions available illustrated by either Sarah Hand or Aijung Kim. Armed with Sharpies and sketchbooks, local artist Matt Lively collected 100 squiggles from folks across our fair city, then got to work outsmarting all of his challengers, turning their squiggles into delightful drawings. We’ve compiled these drawings into a mini-book for your perusal and pleasure. Designed by Chris Romero, paper donated by B.W. Wilson. We have created a handy souvenir for our beloved traveling art exhibit, "What Do You Stand For?" that took place back in 2012. We've turned the whole exhibition into a full-color, pull-out postcard book! Each book contains all 31 portraits in post-card form, perforated for easy tear. The inspiring artist statement from the sixth-grade portrait painter is on the back with space for your personal message. Whether you keep it intact or send the postcards out in the world, this mini-book is sure to leave a smile in your heart.